FreeHourBoost is the Cheapest and Most Reliable Hour Boosting Service Currently on the Market! We offer a Free plan which can be renewed when you run out! We offer many and various features including but not limited to: 2FA Support, Multi Game Support, Auto-Reply, Auto-Accept Friend Requests, + Many More! We are the most reliable and stable steam hour boosting service currently available. We offer various Steam Hour Boosting Packages to meet your needs! 100 Hours for Free, Forever! The Free Plan can be Renewed for FREE Instantly so you Never Run Out of Steam Boosting Hours! Instant Answers to some of our most Frequently Asked Questions. However you can always join our Discord for Direct & Live Support! 01.What Does This Service Do Exactly? FreeHourBoost is a service to boost your Steam Game Hours. Often used to boost your TrustFactor and look more legitimate in certain games, For example: Counter-Strike: Global Offensive. 02.Can I Get Banned For Boosting My Steam Game Hours? No. You can't get banned for boosting your Steam Hours. We use the official Steam API to run our service. 03.Can I play Games While Boosting my Steam Game Hours? 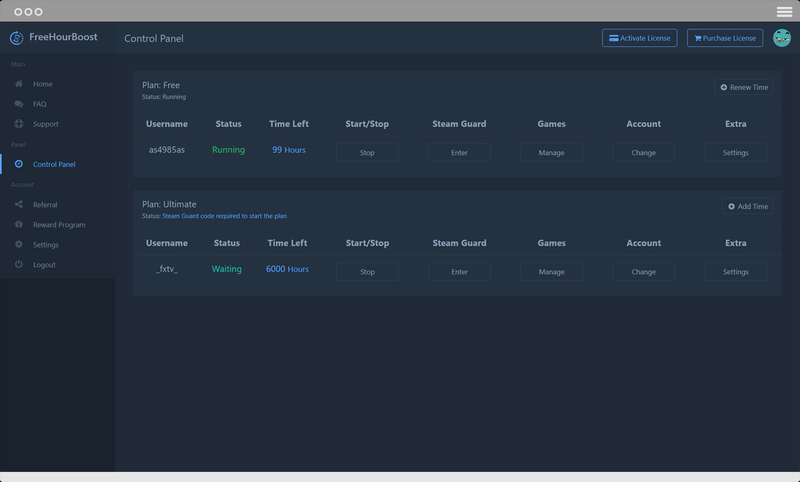 Yes, FreeHourBoost will automatically pause your plan when you launch a game on Steam. If you use the auto-restart feature it will automatically resume Hour Boosting when you closed your game. 04.Can I really Boost my Steam Game Hours for Free? Yes. We offer Free Steam Hour Boosting with the Free Plan. It has 100 Hours but when you've used those you can click the "renew" button and get refilled with 100 new Hours Instantly! We have an Active Community on our Discord. Feel free to join for any Questions. 2019 © FreeHourBoost. All Rights Reserved.